The Under Armour brand has announced the global launch of its "SRLo" sneaker, designed in collaboration with American rapper, A$AP Rocky. The limited-edition SRLo sneaker is out now, priced $250. After dropping in a very limited number (500 pairs) in New York in September, the SRLo men's sneaker launched Thursday with wider availability online. 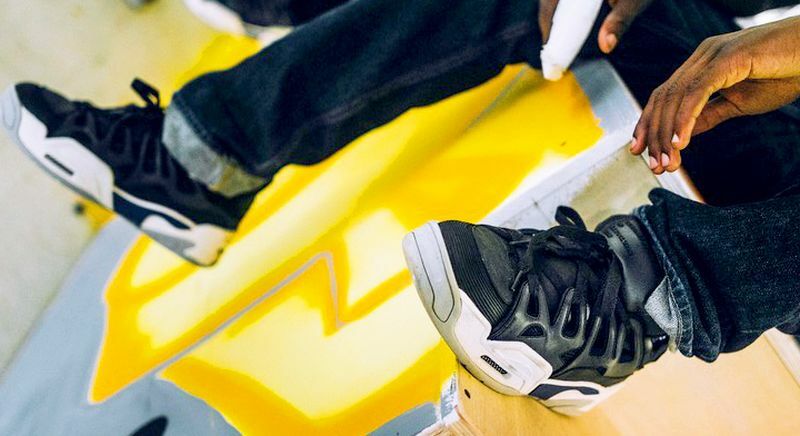 Inspired by the 1990s and the decade's skate and rave culture, the sneaker is the fruit of a collaboration between Under Armour, A$AP Rocky, AWGE (A$AP's creative collective0, and former pro-skater and footwear designer, Dave Mayhew. Inspired by the D3 model, created almost two decades ago by Dave Mayhew, the SRLo have a leather and mesh upper for a tough but lightweight design. The style has been designed with comfort in mind, with features including a rubber outsole with a translucent heel puck featuring the Testing logo, nodding to the rapper's latest album. The model lands in two colorways: black and cream with a flash of blue, or all black for a sleek and sporty look. The sneakers retail for $250 and come with stickers, a keychain and reflective laces.